What Camouflage Pattern Is Best? What is the best pattern for military camouflage? Military planners like the idea of one solution for all uses, as demonstrated in the pixelated Universal Camouflage Pattern (UCP) released in 2004. However, it was outperformed in the field by other designs. Pixelated camo prints, or at least the theory behind them, arrived long before the fashion craze. Their history begins with an experimental psychologist (and Jungian analyst) named Lt. Col. Timothy O'Neill. While teaching at West Point, O'Neill thought to apply new ideas about human perception to the art of the concealment. Neuroscientists had divided the human visual system into a pair of parallel circuits with different functions: One neural pathway alerts us to the presence of objects in the world (where is it? ), while the other helps us figure out what those objects might be (what is it?). O'Neill figured that a smart camouflage would have to take account of both pathways, so he devised a pattern with two overlaid textures. At one level, a "micro-pattern" made of discrete color blocks would blend in with the visual noise in a scene and confound the where-is-it pathway. At a second level, those shapes would form a larger "macro-pattern," like the tree branches in a Seurat painting, meant to break up the symmetries of a target and flummox the brain's what-is-it neurons. In 1979, O'Neill's "DualTex" design was blotted onto the vehicles of the 2nd Armored Cavalry Regiment with square sponges, in the first major field test of digital camouflage. The early results were promising, but it took another 20 years for the DualTex concept to worm its way into the collective unconscious of the Defense Department. As good as the theory might be, testing showed that the UCP finished behind other designs, like the MultiCam pattern and another pattern called Desert Brush. 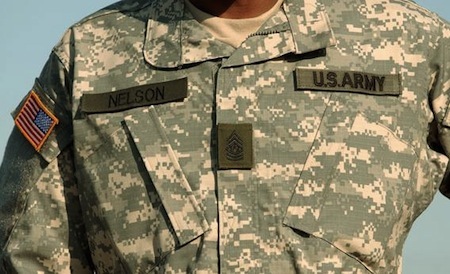 The US Army now seems to be standing behind MultiCam as the new standard. The following video presents 70 different camouflage patterns used over the years; it covers camo patterns used by law enforcement as well as the military, in the USA and many other countries. His body was nearly invisible, an abstract pattern approximating the scribbled brickwork sliding smoothly across his tight one piece. For more specialized uses, take a look at Camouflage To Confound Face Recognition and E-Camouflage - Invisible Tanks. Via Slate.